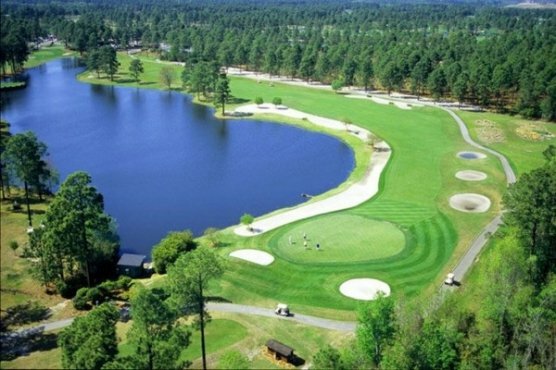 GARDEN CITY, SC – In 2004 the Myrtle Beach Area Golf Course Owners Association awarded Indian Wells Golf Club the “2004 Golf Course of the Year” honor. It could just as easily been the recipient in 2010. There’s much more to this course than the scorecard. At just a little more than 6600 yards from the Blue Tees (136/72.6), 6225 yards from the White Tees (130/70.7), 5811 yards from the Gold Tees (123/69.9) and 4872 yards from the Red Tees (118/68.2) the length, slope and rating are quite average for any skill level. What makes this Gene Hamm designed masterpiece unique is the way playability and challenge are seamlessly blended. This traditional course presents golfers with shot making and distance challenges for sure. However, the course also provides some excellent scoring opportunities. The point is immediately brought home on the very first series of holes. The Par 5 No. 1 requires a drive short of the lake with a second shot to a small landing area and an approach into a very well bunkered sloping green. This is certainly not a difficult hole, but one requiring three good shots, if you plan on par or better. The 2ndand 3rdholes offer a great opportunity for pars or birdies with drives in the fairway and short irons to the green. No. 4 though is the #2 handicap and the only par 4 over 400 yards from the White Tees. There in a nutshell is the character of Indian Wells Golf Club: blending a shot making challenge, followed by two very playable holes followed by a distance challenge. The course is tree lined (A few sit in the middle of fairways!) and there are a generous amount of sand hazards in both the fairways and protecting the greens. Water does come into considerable play. Although some holes do have homes adjoining them, they are not intrusive. Overall the course was in great shape and very attractive. The Par 3s are a nice mix with each nine having one at slightly more than 150 yards and another at slightly more than 180 yards. No. 17 is particularly challenging with a long carry over water. It’s the first part of a great pair of finishing holes. The Par 4s are sneaky long, but there are few hidden issues. What you see is what you get. No. 2 with a drive over water to a dogleg left and a large sand hazard protecting the back of the fairway was a favorite. No. 18 is considered by many the best Par 4 finishing holes in the area. A large sand bunker protects the slight dogleg right. A drive to far to the left brings a tree protecting the green into play. Did I mention the water that protects the green and catches the really aggressive drives? The Par 5s at Indian Wells Golf Club are not particularly long, but each requires your best-shot making. Of course No. 1 is definitely a challenge and sets the tone for all the Par 5s. No. 15 is quite interesting. The shot makers need to hit fairways off the tee and the second shot needs to find a protected landing area. A well-placed wedge into an elevated green provides a scoring opportunity. The “boomers” have an opportunity to go long off the tee and than get home in two with a lengthy second shot over water. Pick your poison. Indian Wells Golf Club is the type of course that appeals to every golfer. You’ll feel at home if you think your way around the course, or you prefer to attack the course in the grip it and rip it mode. This one has long been a favorite of both local and visiting golfers. Give it a try. You’ll be glad you did!